A word on quality & installation: We mount our caps using masonry anchors and adhesive. 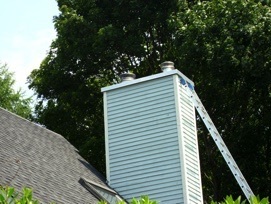 Most of our competition only uses the adhesive which dries out in a few years and then the cap blows off the chimney. Because we bolt into your masonry with anchors we can offer cap installations that are guaranteed for the life of your chimney crown. We only use 18 gauge stainless steel and copper to make our chimney caps and they have a lifetime warranty because they are made to exacting standards from the finest materials. That means we make them to stand up to severe weather, extreme heat, and animals that would make a home in your chimney. 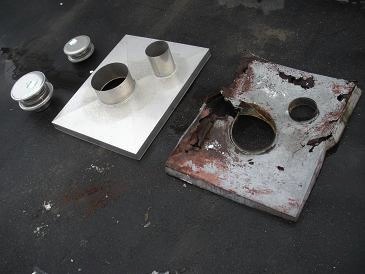 We make them rugged because that's what you need in a chimney cap. 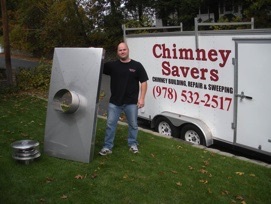 There are other caps and installers, but if you want a lifetime of protection for your chimney, get the best... get Chimney Savers. 2. 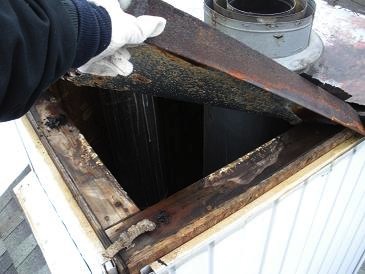 Protect your chimney from water damage - damage caused by water from rain and snow will destroy your chimney. Water runs down your chimney and erodes the mortar joints and damages the firebox in your fireplace. Our energy-saving dampers will protect your inner chimney from water damage during those times you are not using your fireplace. 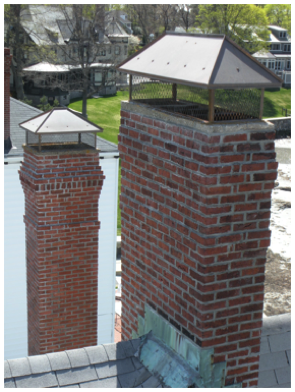 A word on quality: There's a reason we install top dampers on more chimneys every year than any other type of damper. They carry a lifetime warranty. They're made of solid cast aluminum and stainless steel parts assembled to exact standards. Use us, if you want the best energy-saving damper money can buy. Everything else is a distant second. 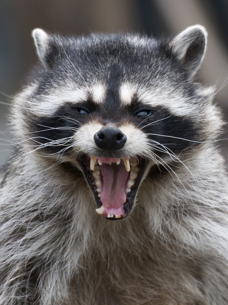 Note: Top Dampers are not designed to keep animals out of your flue and should be installed under a proper chimney cap. 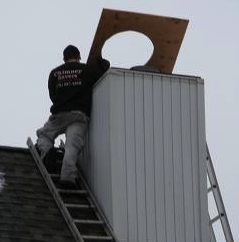 Installing a top damper underneath a chimney cap will also keep snow off the lid and help stop freezing rain from icing up the lid. 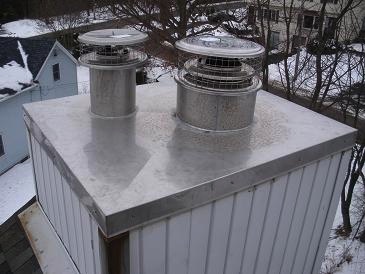 A chimney cap over the top damper allows for proper damper operation (opening and closing for fireplace usage) in all but the most extreme winter weather. Top dampers should be cleaned and serviced yearly when your fireplace is swept (to maintain proper operation) and is this is typically included by most chimney sweeps. 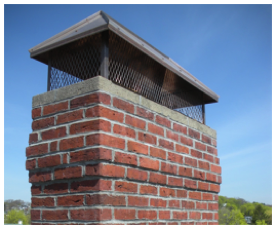 These attractive, durable chase covers are custom made to fit snugly over your chimney chase to offer years of protection against the elements. They can have as many chimney holes as needed, with any diameter and any location. We make our collars to entirely enclose your chimney pipe protecting it and eliminating the need for a caulked storm collar. 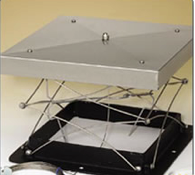 Unlike our competition, we do not use any caulking on our chase covers all seams are welded and soldered. Our stainless steel and copper chase covers come with a lifetime warranty. Chimney Savers can custom make a cap just right for you. Not all flues and chimneys are a standard size or shape. We offer custom caps so you can choose the size, shape, mounting style, and metal you like. We can help prevent big problems, call today for an appointment. 1. 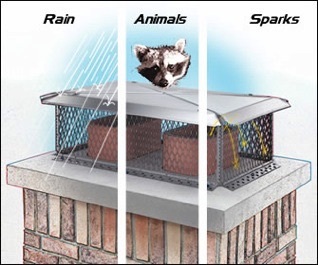 Rain protection - water causes the greatest damage to your chimney of any of the elements. It soaks into the porous bricks, eats away at the mortar, hastens the destruction of the chimney liner, and destroys the chimney crown. 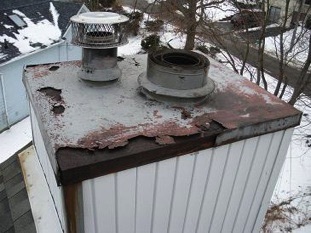 A chimney cap does a great job of protecting your chimney from water damage. 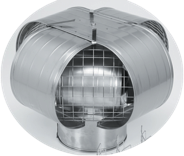 For maximum chimney protection we recommend a multi-flue cap. 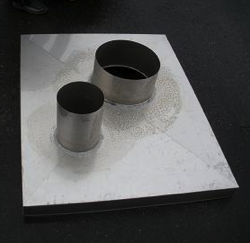 That's because a multi-flue cap covers the entire chimney, not just one flue. most determined critters at bay. stray sparks from your fireplace or wood stove.